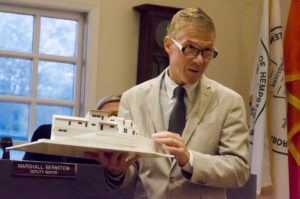 A proposal by Village of Roslyn Trustee Craig Westergard to subdivide his 19,503-square-foot property into two lots set off debate at Tuesday night’s board meeting. Westergard, an architect, and his wife, an interior designer, have lived on the property at 121 Edwards St. for 20 years and spent much of that time designing the home they propose to build on one of the lots, he said during his presentation, after first recusing himself. Westergard displayed a model of the proposed one-story home, which would be shy of 2,000 square feet. It would have a two-car garage built below the home into the side of the hill and a loft on top, which would give it the appearance of being greater than one level. Parking for both lots would be on the property, not the street, Westergard said, which he acknowledged was a concern for residents. He said residents have also approached him with concerns about construction noise, which he said would be no more troublesome than other approved projects in the village. Work would be done during normal business hours on weekdays and heavy machinery would only be on the property for the first week or so to build the proposed home’s foundation, Westergard said. He added he has discussed his proposal with his neighbors living in the cul de sac and the reaction was positive. “I know everybody gets concerned when something new goes in — I want to tell you, it doesn’t have the impact you think,” Westergard said. Throughout his presentation, attendees seemingly on both sides of the proposal mumbled opinions. One woman was incredulous when Westergard said his proposed home was only one level — “it’s clearly two,” she muttered. Another woman and a man got into a whispered argument later in the presentation, one defending Westergard and the other clearly not in favor of the proposal. Residents who spoke in favor of Westergard’s plan called it “lovely.” Linda Blake, a resident of the Roslyn Gardens co-op, challenged those who think the completed project would not fit in with the neighborhood to drive to the area and look for themselves. Another resident, who lives across the street from Westergard and his wife, said she came to the public hearing to learn more about the proposal and was pleasantly surprised. 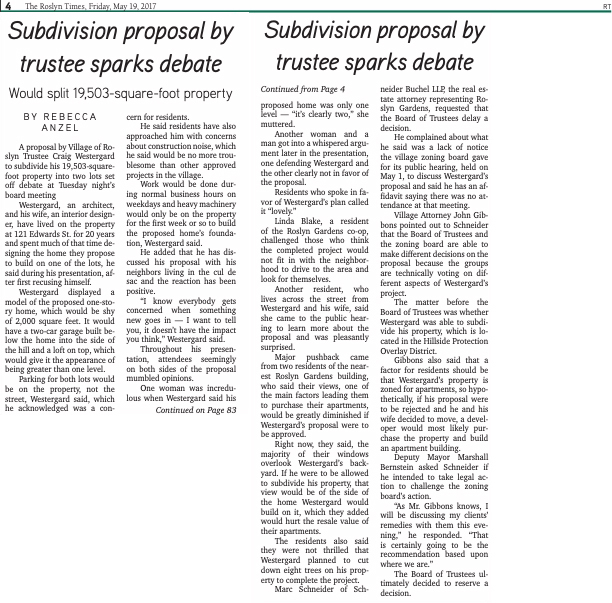 Major pushback came from two residents of the nearest Roslyn Gardens building, who said their views, one of the main factors leading them to purchase their apartments, would be greatly diminished if Westergard’s proposal were to be approved. Right now, they said, the majority of their windows overlook Westergard’s backyard. If he were to be allowed to subdivide his property, that view would be of the side of the home Westergard would build on it, which they added would hurt the resale value of their apartments. The residents also said they were not thrilled that Westergard planned to cut down eight trees on his property to complete the project. Marc Schneider of Schneider Buchel LLP, the real estate attorney representing Roslyn Gardens, requested that the Board of Trustees delay a decision. He complained about what he said was a lack of notice the village zoning board gave for its public hearing, held on May 1, to discuss Westergard’s proposal and said he has an affidavit saying there was no attendance at that meeting. Village Attorney John Gibbons pointed out to Schneider that the Board of Trustees and the zoning board are able to make different decisions on the proposal because the groups are technically voting on different aspects of Westergard’s project. 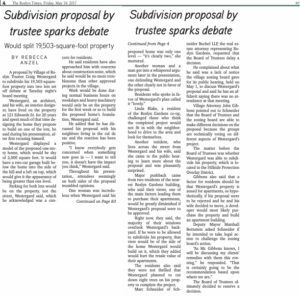 The Roslyn Times published this piece in print on Friday, May 19, 2017. The matter before the Board of Trustees was whether Westergard was able to subdivide his property, which is located in the Hillside Protection Overlay District. Gibbons also said a factor for residents should be that Westergard’s property is zoned for apartments, so hypothetically, if his proposal were to be rejected and he and his wife decided to move, a developer would most likely purchase the property and build an apartment building. Deputy Mayor Marshall Bernstein asked Schneider if he intended to take legal action to challenge the zoning board’s action. The Board of Trustees ultimately decided to reserve a decision. TheIslandNow.com originally published this piece online here.